Buriram United’s 2-1 away victory over Bangkok United before the international break may end up being the most consequential result of the season thus far. Two weeks on, the Angels face a daunting trip to Nakhon Ratchasima, needing all three points to get their campaign back on track. After finishing 7th last season, the Swatcats have looked a much stronger force up front in the opening exchanges of the season. Despite netting thrice in a 3-2 win away at Ratchaburi, the manner in which they were held to a 0-0 draw by Trat will be disappointing for the home side. Table-topping Prachuap take a trip to Chonburi, who are rooted to the bottom after one draw and three losses from their opening four games. More expected of the hosts this season after strong acquisitions during the close season, such as Lukian and Park Hyun-Beom, but ultimately the side has failed to gel. Prachuap, meanwhile, have built their success on defensive solidity and team cohesion rather than individual standout players. Adnan Orahovac, Artyom Filiposyan, and Nattapon Malapun have been unbreakable at the back for the Wasps, and former Chonburi striker Matheus Alves will be looking for a goal on the break when he returns to the Eastern Seaboard on Sunday. Ratchaburi’s struggles continue as the Dragon’s appoint their third full-time coach of the season heading into only the fifth game of the campaign. Italian coach Marco Simone is the one entrusted with taking over the side that languishes just one place above the relegation zone. In his opening match, the former Monaco boss will take on four-time Thai League champions Muangthong, whose campaign seems to be back on track after an impressive 3-2 victory against Chiangrai before the international break. Samut Prakan City will be the next side to visit defending champions Buriram United at the Chang Arena. The Thunder Castle are flying high after their recent results in the domestic league, but their young starlets Supachok Sarachart and Supachai Jaided may suffer from fatigue after returning from the strenuous AFC U23 Championships Qualifying campaign. Elsewhere, Port travel to Sukhothai hoping to keep the league summit within their sights. 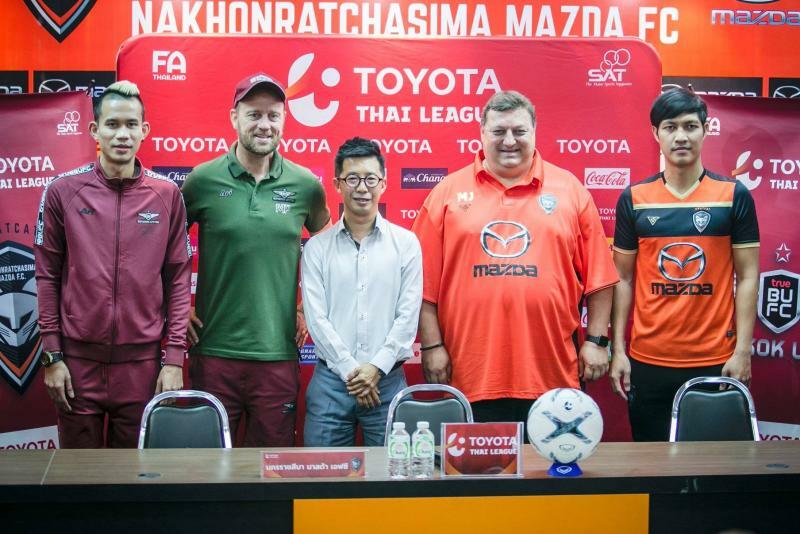 Chainat are already in a struggle to keep their head above water as they face PTT Rayong, and Suphanburi travel to Trat in search of their second win on the bounce.